New Codes For Rental Homes — What is Required of the Owner? 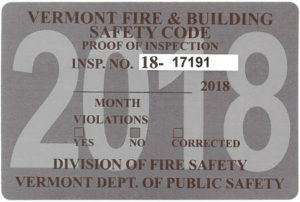 On October 23, 2005 Vermont enacted the current Fire & Building Safety Code. A major change to the code was the addition of 24.1.1.1.1 which redefines a single family home which is rented. Under this rule, the safety code identifies the building occupancy class by the number of sleeping Bed Spaces. A Bed Space is considered a pull out sofa bed, bunks, futons, and beds. If the space can sleep two, then it is counted as two, and so on. As the sleeping numbers increase, so do the requirements. Single Family Rental Occupancy: is for 1-8 bed spaces. Duplex (1&2 family) with a single owner where one unit rents in the 1-8 bedspace category and the second rents in the 9-16 bedspace category, the more stringent 9-16 rules must be followed for both. Duplex Townhouse (units not owned by the same person) where 1-8 bedspace category is on one side, and 9-16 bedspace category on the other, the more stringent 9-16 rules don’t apply to the 1-8 side. Rooming & Lodging Rental Occupancy: is for 9-16 bed spaces. Hotel Occupancy: You might think this was for large hotels, but in fact this is also the standard for homes with 17 bed spaces or more. I cover more then just smoke & CO detectors. When referring to a rented premise, Bedroom egress windows, staircases, commercial fire systems, fire extinguishers, vented heating and locking of exit doors are also looked at. If some of these areas are not code compliant, a full sprinkler system will be needed or you must stop renting. It is my goal to help advise. Most homeowners are renting for income to help pay the cost of their second home in Vermont. If an owner is caught with violations, in most cases, the compliance time before fines & penalties are applied is 90 days. At this point, any chance of qualifying with the existing system has disappeared; and you will have to bring the system up to the current code. Renters can notify the State of Vermont Public Safety of code violations. This can be done for just not wanting to pay the full lodging fees. From the beginning of 2007 to date, the number of inspectors has more than doubled. This has been done to locate rental occupancies and make sure that they all comply with the current code standards. With this, I want to make any rental owner aware of their current situation by supplying the following safety requirements that need to be in compliance based on the number your property sleeps. This is safety for yourself, as well as those who are renting from you. Wired smoke & CO detection. Per NFPA 101 9.6.2.10, commercial system detection wired or wireless can be used. Have a fire extinguisher accessible in main living space. Remove key operated deadbolts from exit side of egress doors. Each bedroom shall have a fire exit window. Must have 5.7 square feet of clear opening when opened and window sill shall not be more than 240” off of ground outside. All decks & stairs over 30” high require railings. Fuel burning heating appliances required to be vented in Vermont. Have your furnaces serviced yearly. Exits need to be kept shoveled in the winter. This is the lowest category where the minimum is required. Rental will allow for State of Vermont enforcement of the above. Existing primary exit stairways do not need to be roofed or have railings meeting new codes. Fire systems do not require yearly inspections. Household smoke detectors need to be replaced every 10 years and household CO detectors every 5 years. Commercial manual-activated fire alarm system required. Yearly TQP inspections required. Must display state stickers. Bedroom doors must be solid core or modified to maintain 20 minute fire rating. Doors must be self-closing and latch shut. 13R Sprinkler system is required if any of the minimum egress standards do not exist and on any new construction or major renovation after 10/2005. Visual Fire Signaling starts at 10 sleeping, without owner occupying building. Commercial monitored smoke system will also help in existing buildings. The most demanding of sleeping occupancy. Egress and fire separation requirements must exist or a sprinkler system is required. Bedrooms require approved smoke detection. All elevated primary egress stairs must be roofed. Fire alarm system must be monitored. Only one locking device shall be on any exit door. No Deadbolts. We are a private company & do not report our findings to the State of Vermont.